NASA astronaut Dan Burbank, commander of the International Space Station, sends holiday greetings home to Earth on Dec. 15, 2011. The addition of three more spaceflyers on Dec. 23 will double the population of the orbiting lab, bringing it back up to full operational strength after a month at skeleton-crew levels. That's good news for scientists keen to maximize the space station's research potential, and it'll make the holidays a little less lonely 240 miles (386 kilometers) above the Earth's surface. "We'll celebrate the holidays in great fashion after they get here," station commander Dan Burbank of NASA said in a space holiday video message. "We've already put up decorations, and we've gathered together all the cards and gifts that our friends and families have sent to us, and we're planning a couple of big meals. That'll be great." But things should change this week. A Soyuz spacecraft carrying three spaceflyers — one American, one Russian and one Dutch — is slated to blast off from Kazakhstan on Dec. 21 and arrive at the station two days later, rounding out the station's current Expedition 30 to its full complement of six crewmates. Burbank is eager for the new group to come aboard, and not just for professional reasons. 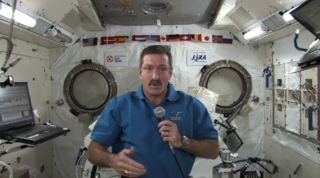 "With their arrival, ISS will be back at full strength, but we'll also have three good friends to join us," he said. "We'll also have them just in time for the holidays." Burbank also sent home holiday greetings to the seven billion people living and working on Earth, hundreds of miles beneath his feet. "On behalf of the Expedition 30 crew aboard the International Space Station, we wish everyone on planet Earth a happy, safe and — most of all — peaceful holiday season," he said. Burbank added that his month in space has been "very busy but wonderful," and that seeing Earth from space is an incredible experience. He described the events of one night in particular, when he looked out and saw the northern lights bracketed by city lights on both sides of the Atlantic Ocean. "This planet is unimaginably beautiful, and it's peaceful and it's serene when you look at it from space," Burbank said. "And that night pass to us seemed like a holiday greeting card, the most beautiful one you could imagine."